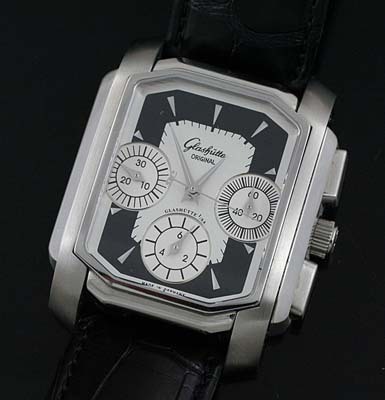 Stunning modern watch from Glashutte Germany. 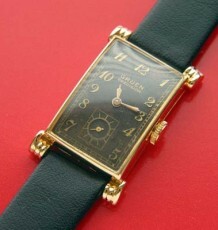 51 jewel in-house movement and stunning steel case make this a spectacular watch. 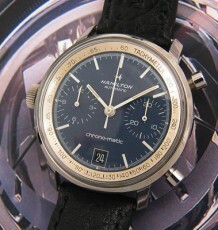 This modern Glashutte Chronograph is a treat to behold. 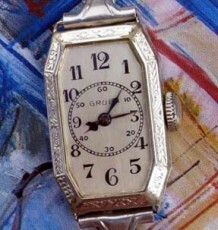 The stainless steel case is mostly rectangular with a slight tonneau shape. The sapphire back allows you to closely examine the 51 jewel automatic Glashutte Caliber 39-31 which beats at 28,800 bph and has an approximate Power Reserve of 40 hours. The movement is finely finished with striped and ribbed surfaces and has some hand engraved patterns and beveled component edges. The two tone silver and black dial contrasts nicely with the triangular steel index hour markers and dauphine hands. The watch contains Chronograph registers for a 6 hour, 30 minute counter as well as a running seconds register. 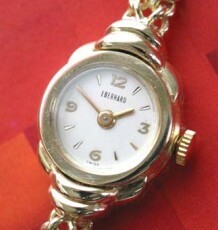 The watch is truly unlike anything else I have for sale and is a very attractive design. The case measures a substantial 35 mm wide by 45 mm long and is supplied on a genuine Glashutte Louisiana Alligator strap wit signed deployment buckle.